In handbooks of the history of music, the name Guarneri is linked to the Cannone, the mythical instrument that belonged to Niccolo Paganini and which he subsequently donated to the City of Genoa, where it is still conserved. In some cases mention is also make of his dualism with Stradivari, but nothing more. Perhaps this is right, because a handbook of the history of music is aimed at a wide readership, and is inevitably limited to mentioning only some aspects of the huge subject it treats. 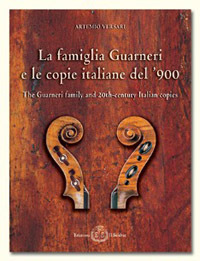 Those who deal more closely with the history of violin making, however, know that the name Guarneri means much more: it is indeed the name of one of the greatest maestros of classic violin making, but it is also that of an entire family of masters, whose role is significant not only thanks to the masterpieces they produced, but also because some members of the Guarneri family took their art outside Cremona, in particular to Mantua and to Venice. Over and above these considerations, to grasp the importance of the name Guarneri in the history of violin making, it might suffice to think how many instruments by the great masters of this family have been used as models by entire generations of makers, right down to our days. The aim of the exhibition and of the catalogue is to point up this particular aspect, enabling the original instruments to be compared with 19 violins made to the Guarneri model, each by a different violin maker, representing the various Italian schools. From this comparison, the greatness of Guarneri del Gesu emerges, as a figure of reference capable of influencing and guiding the development of violin makers who came after him, following a different line than in the case of Stradivari: whereas in proposing the Stradivari model violin makers were seeking elegance of form, refined workmanship, overall beauty, in making instruments to the Guarneri model they were above all looking for acoustic results. And also in some cases achieving them, as the voices of many of the instruments collected for this occasion reveal.